"Young children love to share books with their adults, and this colourful board book offers plenty of opportunities for spotting and talking." "The perfect gift for any baby or toddler, this beautiful book is cleverly designed to allow confident development of speech whilst providing enjoyment for parent and child." 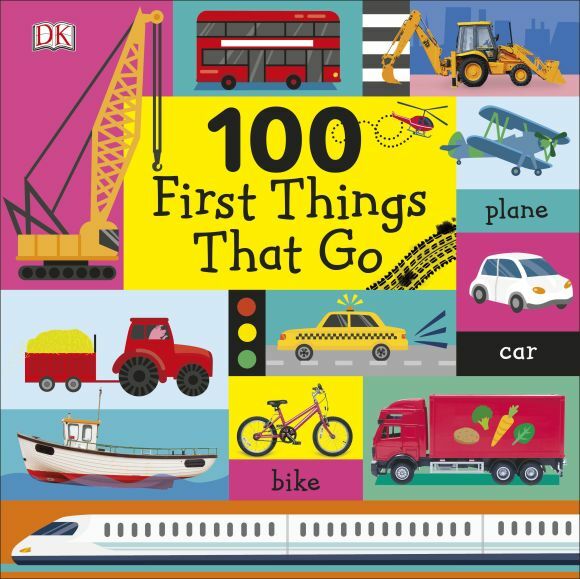 Babies and toddlers can build vocabulary and learn first words with 100 First Things That Go, the perfect baby book for little ones who love cars, trucks, planes, boats, tractors, and diggers. Favorite vehicles are clearly labelled on every page, and the exciting photos combined with fun illustrations provide lots to talk about, learn about, and smile about. This colourful picture book is great for sharing, and an attractive baby gift. Part of a beautiful, first word book series, which includes the award-winning 100 First Words, the big board book pages are toddler tough, and cover everything from cool cars, terrific trucks, and awesome fire engines, to vehicle colours and kids' own bikes and ride-on toys. There are even some entertaining make-believe things that go, such as a fantastic pirate ship and a magic broomstick. Word labels encourage naming and picture-and-word association, building language and reading readiness, while the inviting, look-and-point pictures stimulate talking. Cleverly designed to inform and entertain, 100 First Things That Go takes your baby on an exciting learning adventure.